Menu bar utility to quickly create reminders. Is there a better alternative to Speedy Reminder? 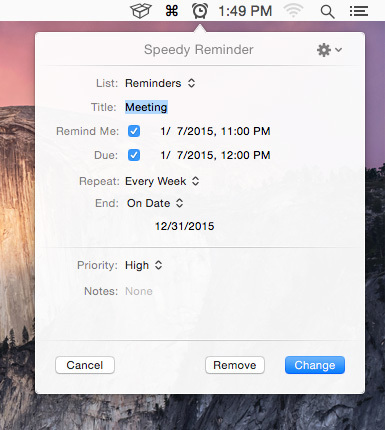 Is Speedy Reminder really the best app in Productivity category? Will Speedy Reminder work good on macOS 10.13.4? Speedy Reminder lets you quickly and easily add to-dos from anywhere without having to launch the built-in Reminders app. Create reminders with title, note, priority, alarm and due date, and recurring reminders. Reminders are synced via iCloud. Fast and system-wide accessible from the menu bar or with a hotkey. Speedy Reminder needs a review. Be the first to review this app and get the discussion started! Speedy Reminder needs a rating. Be the first to rate this app and get the discussion started!